Egurtek is the only congress on architecture and wood in Spain and is a key reference in the sector, thanks to the expertise of its speakers and the brilliance of its work. This year, the programme includes prestigious international architects and engineers such as Dutchman Lidewij Lenders from the MAATworks studio, who will show her houses which are built entirely of wood with renewable raw materials; the Finn Janne Kantee, from Polar Life Haus, whose projects include the “El Lodge Hotel”, located in the Sierra Nevada National Park at an altitude of 2300 m; Andrew Waugh, founding director of the London studio Waugh Thistleton Architects and creator of one of the tallest residential structures in the world, “Stadthaus”; Tszwai So, founding director of the Spheron Architects studio and architect of the “Memorial Chapel” in London, a small chapel dedicated to the memory of the victims of the 1986 Chernobyl nuclear disaster; and Víctor Orive, from Zaha Hadid Architects, who is responsible for the construction project of the new Forest Green Rovers stadium, “The New Lawn”, which will follow the eco-friendly principles held by the English football club. In addition, the Congress will be attended by experts with an outstanding track record nationwide, such as Carmelo Fernández Militino, from TYM Asociados, who designed the structure of 65 state-subsidised homes in Hondarribia built with industrialised wooden systems; Óscar and Iván Andrés Quintela from the Arrokabe studio, winners of the 2016 Egurtek Building Award; and Beatriz Bergasa and Leire Badiola, from Satie Arquitectos, who were responsible for the renovation and extension of “Bodega Fos”, for which they used wood as a link between nature and the building, with a focus on aesthetics and structure. In terms of the design and completion of these works, wood has played a key role in resolving the fundamental issues of contemporary architecture: energy supply, strength, self-sufficiency, comfort and beauty. 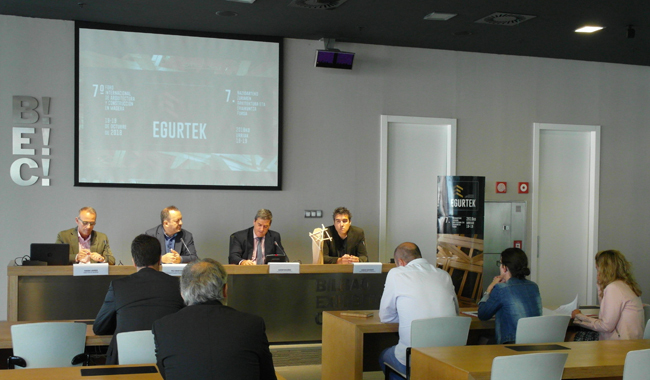 In turn, the Egurtek Technical Seminars will be structured around three main blocks – training in the forestry/wood sector, innovation in wood design and forest bioeconomy – and will be attended by representatives of Hazi Fundazioa, EHU/UPV, the Basque Government, Edupark, Albaola Museum, Disaro, Experimenta, EFI-Efimet, the University of Navarra and Neiker, among others. The seminars have been organised by Baskegur – the Basque Wood Centre. Professionals in the sector will find a number of innovative solutions and trends in the Egurtek Exhibition Area and a full picture of current events in the industry. The foothold that the congress itself has achieved has had an impact on the exhibition, which will assemble the largest number of participating companies nationally dedicated specifically to construction and architecture in wood. In total there will be more than 70 firms, offering products and services related to architecture, wooden houses, wood treatments, sustainable construction, magazines, associations, engineering and decoration, wood for construction, structural design software and importers of wood, components and materials. At the same time, to emphasise the innovative component of the event, the Market Point will once again be set up, an area where exhibitors will quickly and dynamically present the main innovations they have brought to the forum. A wide range of services and products will be presented in 15-minute sessions throughout the first day, related to “elastic suspensions for structure-borne sound in timber structures”, “air tightness in Passivhaus constructions”, “fibre and wood construction systems” and “the circular economy, architecture and construction”, among many others. A total of 123 works competed for the Egurtek Awards this year, a much higher figure than the one recorded in 2016, when 88 panels were submitted to the competition. Since their creation in 2012, the awards have gained in importance in the sector and have become an unmissable event for architects, engineers and professionals in this field. For this edition, a fifth category has also been added to the awards, that of Interior Design, which singles out the best work in interior spaces in new plants, refurbishments, restorations and ephemeral assemblies. In the Building category, the award went to “Two Cork Houses in Llafranc, Girona”, submitted by Emiliano Lopez and Mónica Rivera. This work was positively evaluated due to its expressiveness and integration into the surroundings, its successful implementation in a responsive environment and an exemplary choice and application of materials. In the Wood Design category, the prize went to “Potro”, a work by designers Gerard Bertomeu, Miriam Cabanas and Xavi Santodomingo, due to the simplicity of the design feature through an accurate reference based on a technological innovation. Meanwhile, “ARINA, a table for homes of today”, from designer Silvia Ceñal, won the special award for Local Wood (Basque Quality). The members of the Jury emphasised the proper resolution of the element with some predefined limitations regarding the species and size of the wood. The Publication category is aimed at identifying the dissemination of the use of wood in construction from graphic media, print media and audio-visual and digital media. In this section, the award went to Miguel de Lozar de la Viña, for his research work “La cabaña moderna. Pequeñas arquitecturas en busca de sentido” (The modern hut. Little architectures in search of meaning), which shows the role of wood in the architecture of the modern movement based on the recurring theme of the primitive hut. Lastly, in the new Interior Design category, the award-winning submission was “Architecture Workshop in Pamplona, Navarre”, by Xavier Chérrez and Raquel Cantera, which made full use of the storage and work space with an ingenious solution based on the virtues of wood construction. Participating in the Awards Jury were leading experts in the fields of architecture, design, manufacturing and wood from institutions such as the Official Basque-Navarrese Architects Association, the University of the Basque Country UPV/EHU; the Basque Timber Association, Infoedita professional communications Group, Bilbao-Bizkaia Design & Creativity Council, Arrokabe Arquitectos, the Association of Decorators and Interior Designers of Bizkaia, and EIDE-Basque Association of Designers. The ceremony for the 4th edition of the Egurtek Architecture and Design Awards in 2018 will take place on Friday 19 at 11.30 am in the Auditorium. The official launch of EGURTEK will take place on October 18 at 9:00 am and will be presided over by Bittor Oroz, Deputy Minister for Agriculture, Fisheries and Food Policy of the Basque Government.